100% solids, two component, self leveling, modified epoxy forming a semi-hard durable joint compound, repairs concrete cracks and joints. Ideal for filling joints or cracks in concrete or steel infrastructure that have little or modest movement. 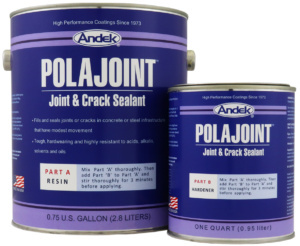 POLAJOINT is a 100% solids, two component, pourable, modified epoxy which forms a semi-hard durable joint compound. It is ideal for filling joints or cracks in concrete or steel infrastructure that have little or modest movement. POLAJOINT remains firm and hardwearing while accommodating a mild degree of movement in the structure. It is highly resistant to acids, alkalis, solvents and oils, and will maintain adhesion to the surfaces of the joint or crack. Fills and seals cracks and control joints in concrete slabs. Seals sawcut grooves in concrete for stress relief, seals around railing posts and equipment mounts. Penetrates into fractures caused by thermal shock to seal and prevent liquid intrusion. Seals gaps to vermin entering food processing areas. Can be used over concrete, fiberglass composites, most metals, mineral composites, wood, wood composites, slate, tile and other surfaces. All surfaces to be coated must be dry and free of loose debris, oil, paint, grease and other substances that would interfere with bond. For proper repair of irregular cracks, it may be necessary to router out the crack into a Symmetrical “U” shape. It is advisable to prime highly porous surfaces or very dense concrete surfaces with Polaprime 21. Very deep joints or cracks need to be filled with a proper diameter backer-rod material such as Dow Ethafoam. In a clean, dry container, mix the complete 2-part unit for at least 5 minutes with low speed mixing. Try not to entrap excessive quantities or air when mixing. 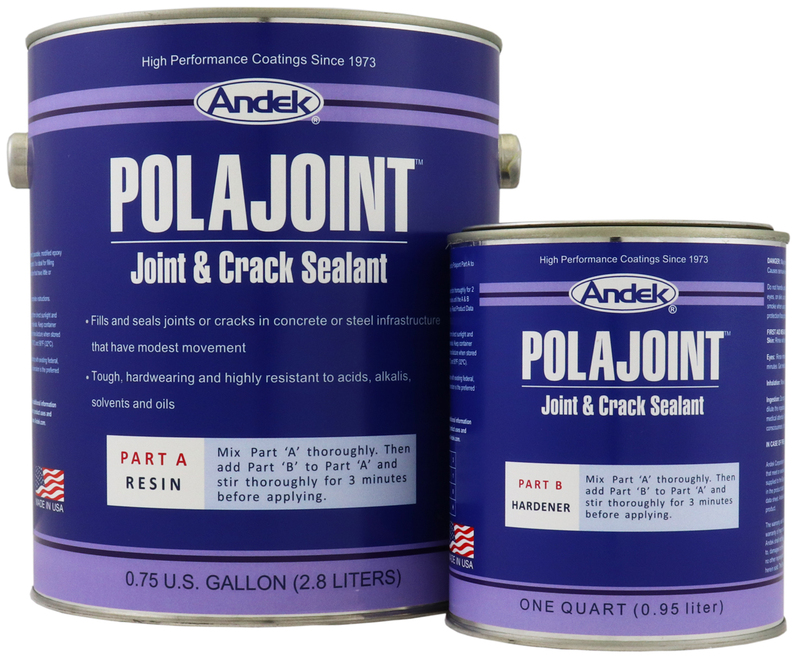 After thorough mixing, POLAJOINT may be poured into the crack or joint through a pouring spout or with a refillable caulking gun. Completely fill the crack or joint. It may be necessary to top off the filled crack or joint after a few minutes of settling and air release takes place. Clean tools and equipment with xylene or toluene solvent before the product cures. Store in a dry area and protect from direct sunlight and freezing. Keep container tightly sealed. Shelf life is 1 year from date of manufacture when stored in a factory sealed container between 50ºF (10ºC) and 90ºF (32ºC).